The trouble first started for singer OS Arun who was set to sing at an event titled Yesuvin Sangama Sangeetham’ conceptualised by T Samuel Joseph. Over the last week, Carnatic musicians in Tamil Nadu have been targets of a vicious online campaign. 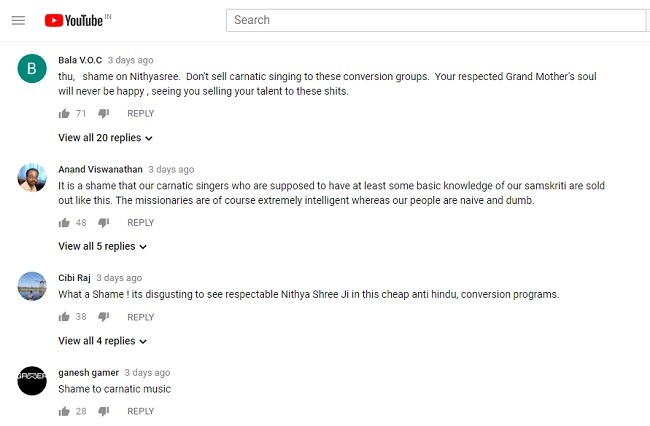 Internet users have descended on their Facebook pages, taken over YouTube comments sections and even Twitter threads to term them - 'traitors of Hinduism', 'shamers of Carnatic music' and 'disgusting cretins'. And all this because right wing fringe groups and online harassers seem to have suddenly discovered that popular Carnatic singers including Nityashree Mahadevan and OS Arun have been actively singing devotional songs for gods of other religions in traditional Carnatic krithis (songs). These 'rasikas' (connoisseurs) as they call themselves, have labelled this a threat to Hindu culture and have launched an insulting offensive against the artistes. The trouble first started for singer OS Arun when he was scheduled to sing at an event in Chennai titled ‘Yesuvin Sangama Sangeetham’ conceptualised by T Samuel Joseph (Shyaam) on August 26. "This was not the first time that we had collaborated. Shyaam has been working with several musicians in the industry for decades now. I myself have sung for albums on Jesus multiple time in a career spanning over three decades," says Arun. He alleges that there was a steady stream of distasteful remarks on his Facebook page and calls from people claiming to be 'concerned' Hindus from across the world. The abuses and comments were over two primary issues - the first was over a Hindu singer choosing to sing in praise of gods of other religions and the second was the appropriation of Carnatic music by other communities. Shame on you OS Arun. All your concerts will be boycotted and I will ensure this message reaches those who don't know what you tried to do! "I announced the very next day that I will not participate in the event because I couldn't deal with the pressure. Music is universal and democratic. I don't think we can curb who sings what and certainly see no problem in using Carnatic krithis for songs on other Gods because we live in a time where we are learning from cultures across the world. I've been singing even ghazals for years and taking part in Sufi festivals. But does that mean I will become a Muslim? No, not at all. But with this pressing upon my mind, I felt my performance would not have been whole-hearted," he says. Due to personal commitments the 25th August event stands cancelled. But even after the cancellation, Arun came under attack from S Ramanathan, the founder of Rashtriya Sanathana Seva Sangam (RSSS). In a leaked audio conversation with the head of this fringe group, Arun could be heard wondering why he was being singled out for the act while other singers had rendered other religious devotional songs. He further pointed out that Carnatic singer TM Krishna had performed at a church. On hearing this, Ramanathan threatened other singers with bodily harm and said he will be addressing them soon. Following this, the harassers who claim to be connoisseurs of Carnatic music began their attack on other singers. They have pulled out pictures and videos of Aruna Sairam launching an album of traditional Christian songs set to classical Carnatic music from 2008, Nityashree Mahadevan singing a Christian song ‘Samaanulevaru prabho’ set to a traditional krithi in 2015 and OS Arun wearing a cross as he performs on stage. "We have brought this upon themselves," alleges TM Krishna. "Carnatic music is highly entrenched in the Brahmanical Hindu system and they have actively encouraged this. So now it is coming back to bite us. The reason that these people are behaving so harshly is because they think Carnatic singers are one of them and feel betrayed that they are not acting as per their bigoted beliefs," he points out. Krishna further believes that Arun should not have called off his performance. "This is the time for musicians to take a firm stand. You should either say you are doing for money which is a professional reason or you truly believe that Carnatic music is not only for Hindus. This is not the time to get defensive," he argues. But that is exactly what happened. While Arun cancelled his concert following the online attack, Nithyashree and Aruna have been quick to dispel any notions that traditional Carnatic krithis can be used for devotional songs in other religions. "Rooted in Carnatic music, I have great respect for all composers, especially The Trinity. I would never ever attempt to sing a Thyagaraja krithi, replacing ‘Rama’ with any other name. That would be completely unacceptable," says Nithyashree Mahadevan in a statement. "That said, I do not see Thayagaraja’s masterpiece ‘Rama nee samaana mevaru’ in ‘Karaharapriya’ to have semblance of any kind, to the Christian song ‘Samaanulevaru prabho’, composed mostly in ‘ShankaraabharaNam'," she explains. She further adds that her performance was an effort to promote communal harmony and that she belongs to a family 'steeped in rich Hindu tradition'.
" I am extremely mindful of the lineage that I belong to, and I work very hard to serve, as well as preserve the rich Carnatic tradition that has nurtured me all my life," says the singer. "I firmly believe that it is an unforgivable offence to be involved in an act that would tarnish the image of our rich tradition and heritage, community, society, nation, and mankind. I shall never ever commit or abet one myself," she claims. Aruna Sairam meanwhile tweeted to her 'rasikas' clarifying that she did not partake in any modification of krithis sung for evangelical purposes. These clarifications, however, have done little to stop the harassment. The singers have been accused of plagiarising, setting a bad example for younger generations and of selling Hindu traditions for money. There have even been calls to boycott their concert. "This kind of bigotry is endless," points out Swarnamalya, a dancer and dance historian. "Appropriation is something that has happened over time and even a Muthuswami Dikshitar whom we sing endless praises for, has composed songs in Sanskrit and Telugu based on Western notes. This later came to be known as 'Nottuswara Sathiya'. Do we not call that genius?" she asks. Then what has sparked this hatred now? "I think it is the atmosphere we live in that is heightening all this. We have become ultra-sensitive and perceive some kind of offence on our culture, making us unnecessarily defensive."